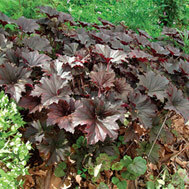 Shiny, bronze to red brown foliage that holds it's color all season. In early Fall, small whitish flowers hover above the foliage on long stems. Useful as a groundcover for the shade that can compete with tree roots.